Arie 8: Sünder ach, zerfließt in Tränen! Tanya Aspelmeier sings newly discovered sacred arias by G.P. Telemann, accompanied by Ensemble Schirokko under the direction of Rachel Harris. 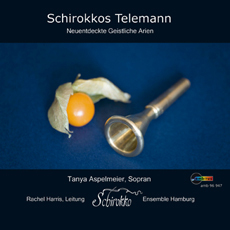 This recording includes previously unheard compositions by Telemann, long thought lost but returned to the University Library in Hamburg in 1992. They had until then been part of art looted in World War II and kept in St. Petersburg, Russia. The eight arias were probably all from different cantatas and were gathered together by an unknown copyist. The arias are all for solo soprano and accompanying instruments, the exact ones not being specified in the score. However, that instrumentation has been chosen which at best underlines the drama of the pieces. Woodwind are added to the strings. Number 7 “Sichres Menschenkind erschrecke”, is the only exception where it is marked that horns should be playing. Unfortunately the horn parts are not included in the surviving score, and these have been written by Rudolph Kelber for the recording. The woodwind parts in the arias have been arranged by Rachel Harris. The texts of the arias are intended for the end of the church year and remind us of repentance and atonement, sins, death and forgiveness. They are complemented perfectly by the unspoken texts of the instrumental choral arrangements by Telemann. Even the violin concerto, despite it's worldly nature, keeps the introverted mood of reflection. To find a counterbalance to the texts in the arias, Rachel Harris wrote a “Fantasia” for the booklet. This unusual text may better help to understand the contents of the Telemann texts than a theological explanation.